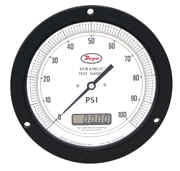 For exceptionally wide media compatibility and reliability, choose the Series 7314D Spirahelic® Pressure Gage with Digital Display. Units provide ASME Grade 3A accuracy (1/4%), readable on 8.5" analog dial and a 4 1/2 digit liquid crystal display. Employing a unique triple-wound helical/spiral Bourdon tube formed from Inconel® X-750 material, the 316 SS connection block includes dual 1/4" NPT female ports for a choice of vertical or horizontal piping. Block includes an integral filter plug to prevent dirt or other foreign material from entering the gage. Gage fits standard ASME 9.0" (229mm) panel cut out. Size: 8.5 (7314D), Size conforms to ASME B40.1. Accuracy: ASME Grade 3A (1/4% of full scale). Pressure Connection:1/4" NPT female, duplicated back and bottom. Wetted Parts: Inconel® X-750 Bourdon tube, 316 SS connection block. Movement: Direct drive of pointer. Overpressure: 150% of full scale. Recommended operation should be between 25 and 75% of full scale. Temperature Limits: 20 to 120°F (-6.7 to 48.9°C). Weight: 150% of full scale. Recommended operation should be between 25 and 75% of full scale. Power Supply: 10-35 VDC (2. 3. or 4 wire), 16-26 VAC (4 wire). Current Consumption: DC; 38 mA maximum. AC; 76 mA maximum. Weight: 1 lb. 11oz. (765 grams). Accessory: (1) 1/4" NPT pipe plug.